Reduce the heat to medium and add the mushrooms. Cook, stirring occasionally, 4 to 5 minutes or until golden brown. Stir in 1 cup of the beef broth, the dry onion soup mix, and the vinegar. Bring to a bubble, scraping the bottom of the pan. In a small bowl, whisk the corn starch into the remaining 1 cup of beef broth. Pour it into the skillet and stir well. Bring to a simmer and allow the gravy to thicken. 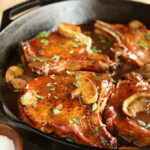 Return the pork chops to the skillet and spoon the gravy over them. Serve immediately. You are welcome to use other cuts of pork - center cut, boneless chops, etc - you just may need to adjust the cooking time accordingly. This is another place where having a thermometer comes in really handy!